Password Productions often collaborates with leading publishers to create exclusive, eye-catching West End and regional theatre events promoting major titles and authors. We have found that carefully produced theatre events can dramatically increase the marketing, press and actual hard sales opportunities surrounding a title launch and reach a far wider general audience than book pages, syndication and literary festivals conventionally offer. We work hard to help make the very best of the short window of time that publishers usually have with authors to promote a major new title. In many cases, Password takes the risk of producing the events and they cost the publisher nothing. For instance, in Malcolm Gladwell’s case, his previous titles Blink and The Tipping Point were much better known than he was as an author. The Lyceum event helped position Gladwell as a major literary brand. For the launch of Stephen Fry’s The Fry Chronicles an event at the Royal Festival Hall on publication date was broadcast live, via satellite, to 60 cinemas throughout the UK. It was, and remains, the biggest UK book launch ever. SANDI TOKSVIG – MY VALENTINE – Virago – two major UK tours and Edinburgh Fringe seasons to promote Sandi’s novel Valentine Grey. STEWART LEE’S STEWBILEE – Faber & Faber – launch of Stewart’s book How I Escaped My Certain Fate. A big evening of top comedy and music at the Edinburgh Festival Theatre during the 2011 Edinburgh Festival Fringe. I wouldn’t normally promote a book by having it ripped up on stage but here is a fan’s YouTube clip of Richard Herring (Stewart’s former comedy partner) invading the stage. Password have gone on to sell over 10,000 copies of the book at Stewart’s live shows. STEPHEN FRY LIVE! in THE FRY CHRONICLES LIVE! in TROUSER-HUGGING 2D! An event at the Royal Festival Hall on publication date in September 2011 was broadcast live, via satellite, to 60 cinemas throughout the UK. It was, and remains, the biggest UK book launch event ever. This was followed by three big UK tour dates and an event hosted by Delia Smith at Norwich FC.Stephen performed for 90 minutes alone on stage. He gave every town he was broadcasting to a name check to the delight of each cinema’s audience. He signed many thousands of books. Especially attractive to Penguin was that many participating cinemas displayed Fry Chronicles cinema posters in the run up to the broadcast and all showed this trailer on all their screens for several weeks before – alongside trailers for Hollywood blockbusters: watch trailer here . This was, effectively, a free cinema ad campaign for the book. Fry Chronicles Live! was broadcast to 60 UK cinemas in 2011 – the cinema network has now expanded to a potential 200 cinemas in the UK and there is also a massive international network now available for the first international satellite book event. In 2014, Password also presented five live dates to support the publication of Stephen’s book More Fool Me. The book went into the hardback charts at Number One. This time the show was broadcast by satellite throughout the world and is still available on Netflix and other digital platforms. 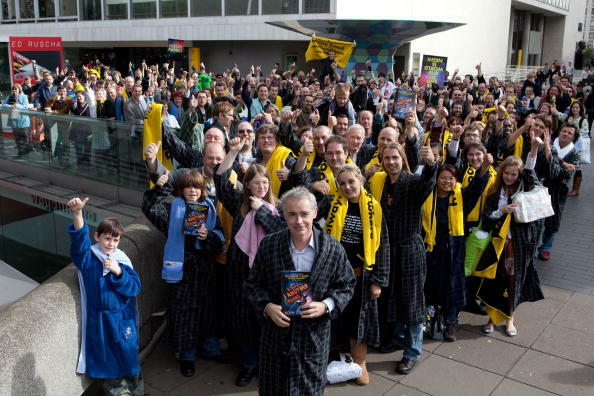 Again – this was the biggest book launch ever – beating its own record. Malcolm Gladwell’s previous titles Blink and The Tipping Point were much better known than he was as an author.Despite being one of the most sought-after speakers in the world, speaking to major corporations such as Google for high fees, I realised that Malcolm had never, outside small literary events, spoken before a general ticket-buying audience.To mark the publication of Outliers, Password produced two sell-out shows on one Monday evening in November 2008 at the West End’s Lyceum Theatre (where The Lion King plays) . 4,700 attended.Press coverage was extensive and positive – including The Guardian leader page (link). Since then Malcolm has done two hit UK tours with Password attracting large, appreciative audiences and more great press.All three shows were world premieres especially written by Malcolm for live performance.The Lyceum event and the tours undoubtedly help position Gladwell as a major literary brand in the UK. • a free exhibition in the foyer of Hitchiana included Douglas Adams’s enormous bath. • a staged radio-style broadcast of Hitchhiker highlights featuring all the surviving cast of the original radio series with guest appearances by Andrew Sachs as ‘The Book’ and The Simpsons‘ Harry Shearer. AN EVENING WITH JON STEWART & THE DAILY SHOW To celebrate the publication of AMERICA (The Book), Jon Stewart made his UK and West End debut with two sell-out shows at the Prince Edward Theatre in December 2006. Special guests included Ricky Gervais and Woody Harrelson. EOIN COLFER – FAIRIES, FIENDS & FLATULENCE Eoin Colfer, the best-selling children’s author of the Artemis Fowl series, is a naturally funny and charismatic man. His books and their characters were much better known than him so we developed with Eoin a stand-up show for kids which he peformed on tour throughout the UK in Summer 2006. The show transferred to the West End for a ten day run for Easter 2007 and toured the UK again and in the USA in 2008. Here’s a promo we did for Eoin’s second UK tour.